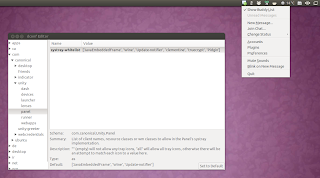 As you probably know, the Unity notification area (systray) whitelist is no longer available in Ubuntu 13.04+ (so that includes Ubuntu 14.04 and 14.10) so you can't whitelist applications to be able to use the systray. If you can't live without an application that still uses the old notification area, here's how to get the Unity systray whitelist back in Ubuntu (Unity). Java and Wine applications have been hard-coded and continue to show up in the notification area but there are still some applications that don't have an AppIndicator and thus, can't use the systray. Some of the popular apps that can't use the systray anymore in Ubuntu 13.04+ include: Truecrypt, Cryptkeeper, Blueproximity, Pidgin (if you don't want to use the Messaging Menu) and KeePassX (although KeePassX from the Ubuntu repositories has the systray disabled in its settings and it can be enabled so for it you'll have to either use a PPA or build it from source). Then, restart Unity by pressing ALT + F2 and entering "unity" or by logging out. The PPA now automatically whitelists all applications so there's no need to manually whitelist individual apps to be able to use the systray. Then, restart Unity or log out and log back in.